"This is a classic Betty Alderman Designs applique quilt pattern in digital format. 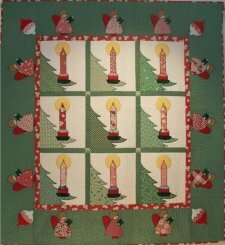 This delightful Christmas quilt pattern includes angels, Christmas trees, ornaments and bubble lights. "During the 1940s bubble lights on Christmas trees were all the rage. They are still sought after today by collectors of Christmas memorabilia. Little wooden angels march around these Christmas trees, helping us remember times gone by. "Directions for machine and hand applique are included in this quilt pattern. You could also embroider these Christmas designs in redwork and further embellish them with fancy embroidery stitches. All directions are included as are color photographs. The last page includes a takeaway supply list so that you can easily get what you need from your favorite quilt shop without taking the entire pattern with you."